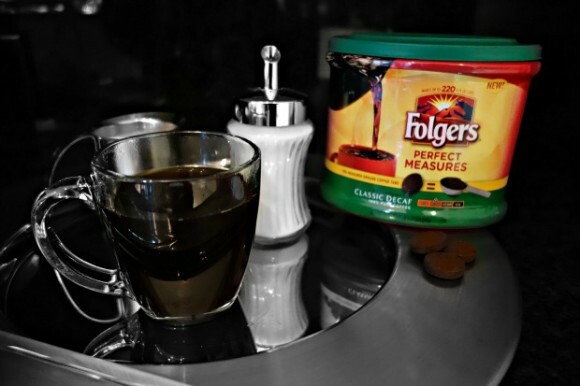 This is a sponsored post written by me on behalf of Folgers for IZEA. All opinions are 100% mine. When I was a little girl my family owned a duplex. There were 8 of us; Mom, Dad, my two sisters, me; the youngest one, and my maternal grandmother. We lived on the first floor of the duplex. My dads mom and sister lived upstairs in the other half. 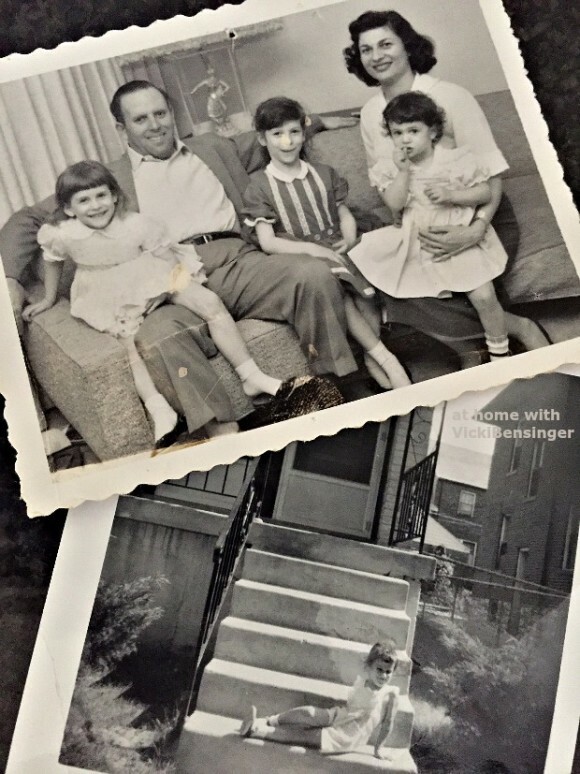 (I’m sitting on my moms lap (1 year) & lounging on the stairs outside our duplex @ age 3) On Sunday mornings my sisters and I would join my dad and go upstairs to his moms for a Sunday morning breakfast. I can still recall the aroma of Folgers coffee and bacon that filled the space – it was magical! For hours we would spend the morning upstairs eating, laughing, and playing. What I remember most vividly was sitting on my dads lap at the dining room table while he drank his Folgers coffee. I loved the smell so much that at the ripe age of 3 my dad offered me a sip. Coffee was what the grown-ups drank, so sharing his cup was quite special! 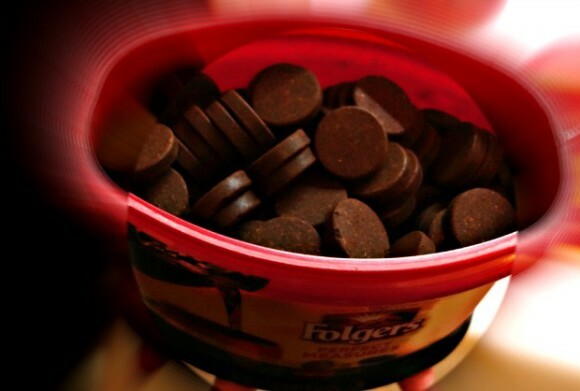 My dad took his Folgers with a touch of cream – it was heavenly! Many decades later I still drink my Folgers that same way. To this day when I smell coffee I reflect back to the days of sitting on my dads lap and sharing his cup of Folgers. Truly the best part of waking up those Sunday mornings was sharing the Folgers from his cup. They’re 100% pure coffee to be used in an automatic drip coffee maker. (Currently available at Sam’s Club and Schnucks in St. Louis, Kansas City, and Indianapolis). They come in 5 flavors: 100% Columbian, Breakfast Blend, Classic Roast, Classic Decaf and Black Silk. 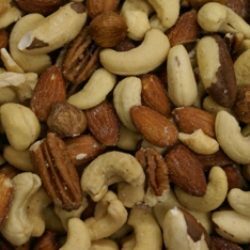 I’m a decaf drinker and found the Classic Decaf to be smooth and full of flavor. Although I had to try the Black Silk what many of the others tested, and it was sensational too! Perfect Measures are small Tabs, the equivalent of one 6 fluid ounce cup of coffee – depending on how you like your coffee will determine the number of Tabs you use. Making Perfect Measures easy to personalize, so you create the perfect cup every time! 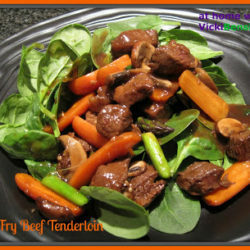 They require NO measuring, and NO mess – what could be better! I wish we’d had Folgers Perfect Measures when I was growing up. I know my kids would have enjoyed these as well when they went to college since finding that perfect scoop was always a challenge for them. Plus they’re environmentally friendly without small containers to toss away. I think this would be an ideal gift for a new bride combined with a coffee maker, a college student, an office, and for myself. 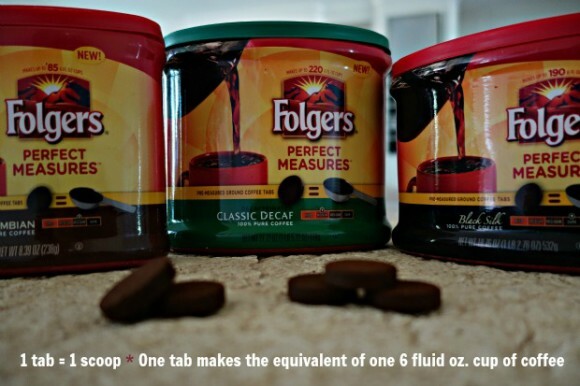 Folgers Perfect Measures are a convenient way to make a consistent, great tasting cup of coffee every single time! Of course, don’t take my word on it, try it for yourself. I’m sure you’ll agree with me. I had the best time meeting everyone on Tuesday, while sampling the new Folgers Perfect Measures and also enjoyed a wonderful lunch! To top off the afternoon, I got a new coffee maker with a variety of Folgers Perfect Measures to take home and share with my family and friends. Making coffee this Thanksgiving will be a snap! By the way, while at the event I conducted a live broadcast on Periscope.tv/VickiBensinger with Cori & Danielle sharing the news about Folgers Perfect Measures. Click the arrow below to listen to what they had to say. Now we’ll have new memories to make with these revolutionary coffee Tabs by Folgers. Do you have a favorite coffee memory? If so, please share it in the comments below. Have never seen coffee in tablets before..how interesting and convenient! 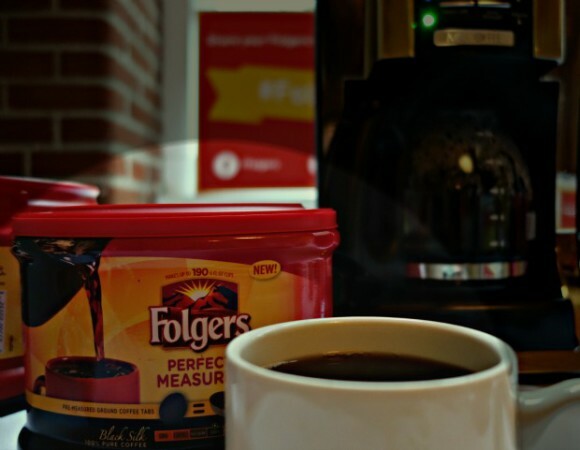 Folgers Perfect Measures are new, and honestly they make the BEST cup of coffee. It totally takes the guesswork out. Once you determine how many tabs you like for your perfect cup, that’s it! Make a single cup or an entire pot. It couldn’t be easier! My kids love this idea as well. Too bad they didn’t have it when they were in college. Better late than never! What will they think of next? That’s what I’ll be serving this year for Thanksgiving. Folgers, good to the last drop!! What a convenient idea. I will definitely search for these next time im at Schnucks. Thank you for the heads up. Yes my kids will love these too! You’ll be thrilled at how easy it will be to make a pot of coffee and how smooth and flavorful it is. My kids were excited about these tabs. Now they can just toss in some tabs without the mess of grounds, go get dressed for work and walk out to a perfect cup of coffee. It’s a brilliant idea! I grew up with Folgers too. What great memories for you! I wish they sold it in Australia! They are great memories. While it may seem insignificant to most it’s just one of those things that made an impact on me as a child that I’ll never forget. Now that you mentioned that you’d like Folgers Perfect Measures in Australia, who knows maybe they’ll test market it there as well. I haven’t had Folger’s in years! What a blast from the past. Those tabs look kind of interesting. Thanks for the heads up. The tabs are revolutionary, making the perfect cup of coffee has never been easier. Yes it will be Gail. Now you’ll be able to have a consistent cup of perfect coffee every time! I’d love to hear what the others in your office think about these as well. Thank you for your comment. I love memories that are created around food and drink. What seem memories you have Vicki! You can never lose memories, they’re with you for life. What I’d give to sit on my dads lap again to take a sip of his Folgers! This coffee tablets are totally new to me…I yet have to see this…so interesting Vicki. 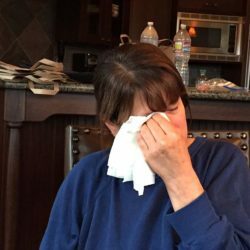 Food and memories…somehow they go hand to hand. 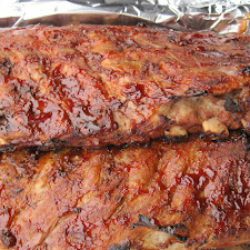 that’s looks very tasty. I want to make it at home and give it to my husband and son.